Do you ever feel inexplicably dissatisfied even though you shouldn't? Overwhelmed with too many thoughts? Overwhelmed in general? Frustrated? Lost? Confused? Just unhappy? 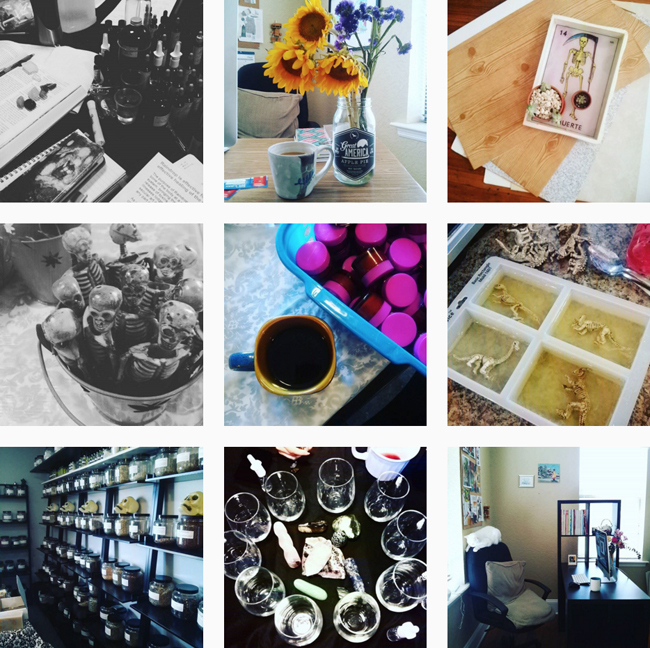 Follow Along as I Participate in 100 Happy Days via Instagram. My latest shots above. Of course you do, even the happiest among us do at some point! I got a bad case of it yesterday and it inspired me to do this challenge again. If you're like me, chasing happiness or trying to find focus in life, I challenge you to do the 100 Happy Days challenge with me. I did this challenge last year and can confirm that it's mood boosting and life clarifying! Right now I could really use that clarity again, so I'm getting back on this challenge! Following up on these claims, I did feel happier and more optimistic when I stuck to the challenge. I even fell in love! (It was beginning when I took this boat ride with AJ.) Last time I didn't count the exact days and may have missed a day-or-two by accident, this time I calculated the end-date to make it easier: January 31, 2016! I like how starting today makes the challenge conclude on the last day of the first month of the new year, because I'm a sucker for arbitrary important-sounding numbers and dates. If you want to start it with me, you can start today, or you can make it more "even" and start Monday, October 26th. Then you'd take a picture a day for 100 days straight ending your challenge on February 3, 2016! But really, start today, WHY delay happiness? 1. Take a picture of something that's made you happy. It can be anything. Work, school, eating, your pets, pie, dinosaurs. 2. Share this image on Facebook, Twitter, Instagram, all three, whatever your social media of choice is. Tag it with the hashtag #100happydays. Or make up your own personal hashtag. You can just e-mail it to myhappyday@100happydays.com if you want to keep your journey private. That's it, you just take a picture of something that makes you happy once a day for 100 days straight. 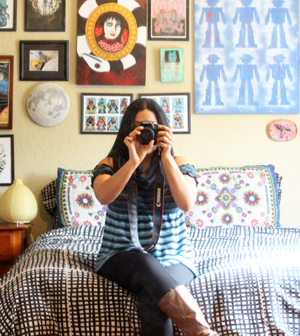 I take multiple photos every single day for my blog, for fun, or for clients. This project helps me reflect on why something I'm photographing is making me happy, and it help you feel grateful. Hopefully, you'll learn things about yourself. I learned that one of my top happiest moments is first thing in the morning sitting at a clean desk and writing/working with something to drink and feeling inspired! If you join the challenge please let me know via e-mail or via social media. You can follow along as I keep this challenge rolling daily on Instagram. If enough people want to join up, maybe we can make our own hashtag to keep up with each other's progress! 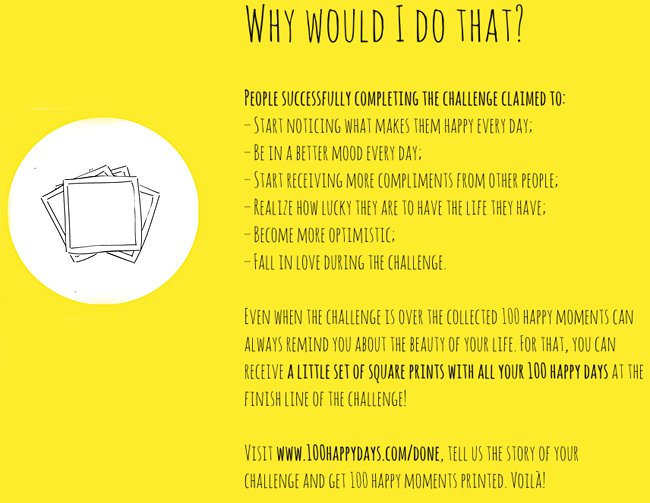 Also, this time, I'm going to go to the awesome Challenge Finished page (actually didn't notice that before) and get my 100 Happy Days printed, there's an interesting way this can happen for free! Note: To clear up confusion, this challenge isn't about being happy every day 24/7 or being happy all day, but increasing optimism and gratefulness by stopping to consciously photograph what makes you happy in a ritualistic way. /Comments Off but let me know via e-mail if you want to join in or have any questions.